Molenbeek is one of the 19 bilingual communes of the Brussels Capital Region. The name from Molenbeek comes from two Dutch words meaning “mills” and “stream”. Although first applied to the brook/stream that ran through the village, the name eventually came to be used to designate the village itself around the year 985. In the lower part of the commune is an industrial and commercial zone that attracts a lot of the populace. And in the upper part of the commune one finds the residential neighbourhoods with green spaces. Molenbeek has around 85 000 inhabitants and a high population density of 13 000 hab/km² which is twice the Brussels’ average. Several run-down industrial buildings have been renovated and converted into prime real estate and other community services. Examples include the Raffinerie, a former sugar refinery that is now the site of a cultural and modern dance complex; the Fonderie, a former smelter that is now home to a labour and industry museum; the Bottelarij, a bottling plant which was housing the Royal Flemish Theatre during the renovation of the theatre in the centre of Brussels; and the most impressive Tour & Taxis building and surrounding area, which will be turned into various up market residences, as well as commercial enterprises. About 100 public buildings, representing approximately 100 000 m². To raise public awareness and encourage the building users to become active players in the environmental improvement of Molenbeek’s buildings. Since 2006, the commune of Molenbeek is a member of a local action plan for Energy Management (PLAGE – Plan Local d’Action pour la Gestion Energétique). This project was launched and co-financed by the Brussels Capital Region with the goal of achieving a 25% reduction of energy consumption in municipal buildings. Besides the refurbishments of buildings (better insulation, control systems), the commune realized that it was necessary to change the buildings users’ behaviour. Because of this key point, the city launched the second part of its campaign to raise public awareness. An awareness raising plan was implemented with the help of the Energy Director, an eco-consultant and the committee of the PLAGE project. 1. Communication of goals and energy objectives of the commune. 2. Communication of the buildings’ performances. 4. Awareness raising of buildings’ users. In order to facilitate the understanding of the diverse factors that contribute to the environmental performance of buildings, didactic thermometers were placed in all offices and schools next to the Display posters; together with monthly graphs about the building’s energy and water consumption. •	Know the exact temperature needed within the classroom and the corridor. •	Know the heaters’ control position according to the indoor temperature. This helped the employers to avoid discussions about the temperature adaptations. •	Know the “HELP DESK” line for reporting any energy malfunctioning of the buildings. When the Display posters were hung up the didactic thermometer was introduced along with the Display poster to the employees and students. Creative tools were designed and implemented in the commune of Molenbeek. 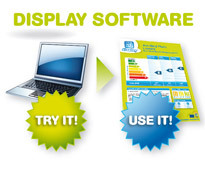 Display® Posters, Didactic thermometers, monthly graphs and a HELP DESK line. _ •	A TV program on Télé Bruxelles about the deficiency of school 16. Class GGG. •	A document about CO2 reduction policies and air quality improvements (article “Union Locale pour le Climat”). •	Articles in the journal Molenbeek info. •	Posters about the replacement of light bulbs. •	Presentation about Display posters and the Didactic thermometers at the Sustainable Development Commission. •	Energy exhibitions in schools done by the students. •	Conferences for residents on how to achieve improvements without investments. •	Information to buildings’ users about the importance to stop heating during summer. •	Information to buildings’ users about the labelling of PLAGE’s buildings. •	Information talks in schools and in administrative building. With its intensive and long term communication campaign Molenbeek is looking to achieve a 25% reduction of energy consumption in municipal buildings within the next two years. Cost in the PLAGE project (2006, 2007 and 2008) : 170.000 € for employees cost and 700.000 € invest in building’s improvements. On base of the energy consumptions of the year 2006 (1.250.000€), a 25% reduction will save 310.000 €/year and 1300 tonnes of CO2 per year. Bruxelles-Environnement/IBGE. Launch and co-finance of the project PLAGE and the project Energy Challenges in Schools. ICEDD. Methodological and technical support. Energy efficiency consultant. methods and institutional strategies. Apere. School coach in the Energy Challenges project in Schools. Le Centre Urbain asbl – ABEA. Energy conference and School project “Kids4Future”. On the 22 of November 2007, the commune of Molenbeek voted for the “Union Locale pour le Climat” movement, which defines the guidelines and objectives to promote CO2 reduction, sustainable mobility and involve the population. Molenbeek’s local Display awareness campaign supports this movement. Besides the awareness campaign, several technical actions were carried out in municipal buildings. Energy consumption is monitored annually for the entire public building stock and monthly for the 10 largest consumers. Many passive house building projects and low-energy renovation are being started. Two buildings have already been selected as exemplary buildings by Bruxelles-Environnement/IBGE. Also, the commune established a Sustainable Development Commission. This Commission integrates the sustainable development objectives within the commune’s administration. Its intensive communication campaign together with easy and helpful tools, are an excellent strategy to reach the goals defined of reaching a 25% reduction in energy consumption. Simple tools like the Display Poster and stickers or the didactic thermometers are very helpful for the building users’ in order to better understand and be active in sustainable way of living. These tools as part of a diversified communication campaign including posters, events in schools, articles in journals, TV program, together with the HELP DESK line are creative initiates that we should lean from. However Molenbeek’s success story would be incomplete without managing their commitments to intensive building management , (e.g. monthly graphs) and an ambitious building refurbishment programme.